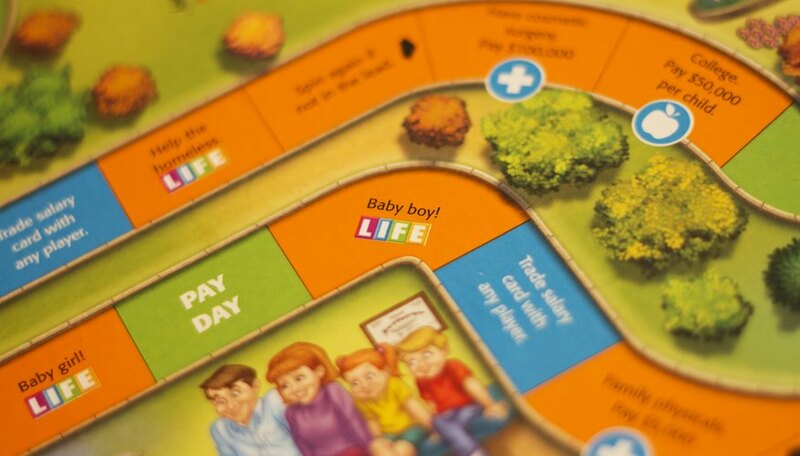 The Game of Life is just what its name implies: a board game that takes players through the many life stages of working and having a family. The game itself has a long list of rules, but they can be easy to grasp. 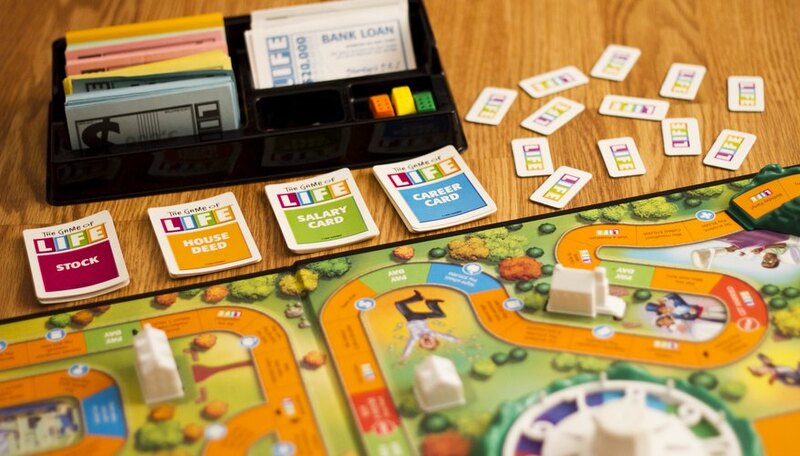 The ultimate objective is to "retire" from the game as the player with the most money in both cash and other achievements depicted on the "Life Tiles." Lay out the game board. 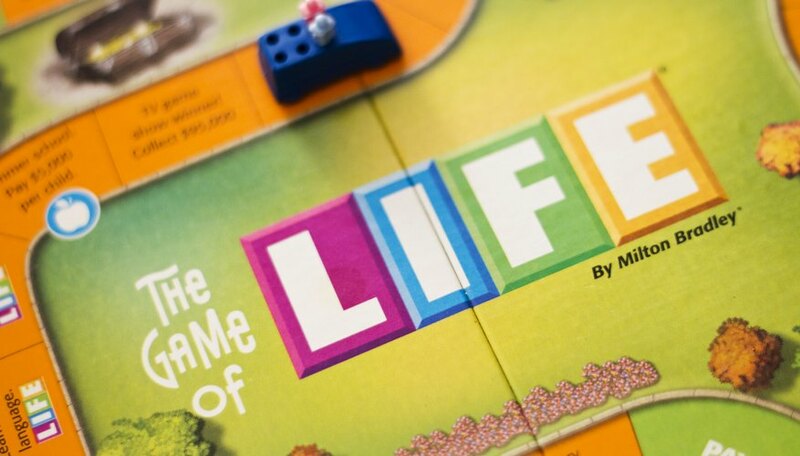 The game's small "Life" tiles go in a pile near the board with the sides that say "Life" facing up; draw four of these tiles and stack them on the board's "Millionaire Estates" spot. Assemble the bank on another side of the board; this includes the money, the bank loan and policy papers, and the four decks of cards. One player serves as the banker and gives $10,000 to each player. Each player chooses a car piece with a player peg inside. All players spin the wheel, with the highest spinner going first and the other players going clockwise. On their first turn, players place their game piece on the "Start Career" or "Start College" space. Players starting a career draw a random Career Card--they must draw again if the card says "Degree Required"--and then a Salary Card. Players starting college borrow $40,000 from the bank. When they land on the "Job Search" space, they draw three Career Cards and three Salary Cards and choose one of each. 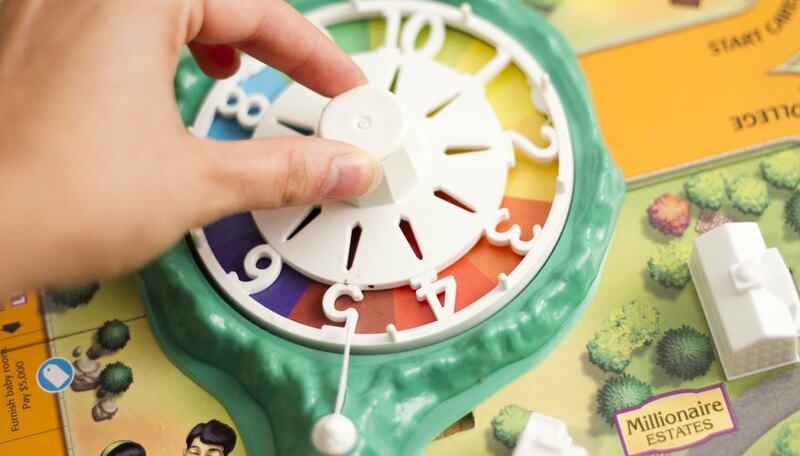 All other turns for all players involve spinning the wheel and moving the required number of spaces. Players must follow the instructions on orange spaces, but choose whether or not to follow instructions on blue spaces. They collect salary for landing on or passing green spaces. They must immediately stop on red spaces regardless of the roll, follow its directions, and then move again. Players who land on a Life space draw a Life tile without looking at it. Players who land on a Career space must pay a stated amount of money to the player with that career (or to the bank if no one has that career). 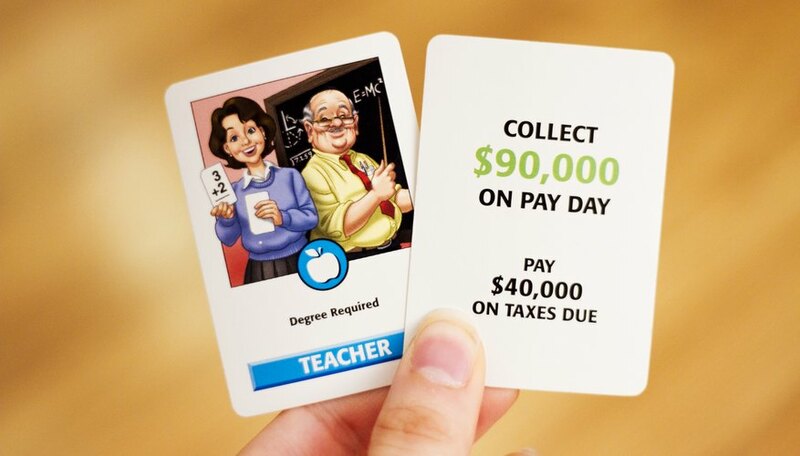 Players must change Career and Salary cards upon landing on a "You're Fired" or "Mid-Life Crisis" space; they may choose to change these cards when landing on a "Night School" space. They add a people peg to their car and draw a Life tile when landing on a "Married" or "Baby" space. When they land on "Buy a House," they take a random House Deed card and pay the deed's price. Players may borrow from the bank and pay back the loans at any time. They also may buy automobile or homeowner's insurance to protect their house or car. Players may buy a stock, which pays $10,000 when a player spins that stock's number. A player landing on the "Retire" space stops playing, pays off all debts, puts aside all cards except a Stock card (which still can pay them money), and moves their car piece to Millionaire Estates or Countrywide Acres. 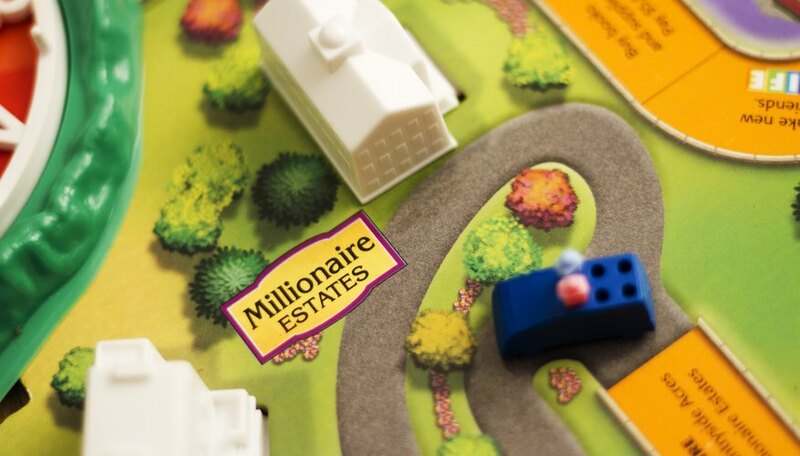 Players at Millionaire Estates can have their tiles drawn from other players should the draw pile run out, while Countrywide players are protected. Once all players retire, the player at Millionaire Estates with the most money gets the four tiles stacked there. The players then turn over their tiles, add up all the dollar amounts from those tiles, and add that amount to their cash; the richest player wins.